Friday I decided to make a Christmas wreath using a wire coat hanger and a bunch of different materials I already had on hand from various yards sales. Yes that is right the material, ribbon, red beads, and even the bells were all bought at various yard sales and then stored by me in my crafting bins until inspiration hit. 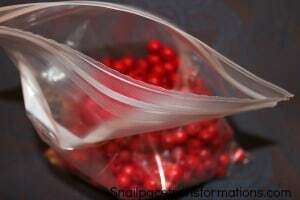 You might not have a plentiful supply of red wooden beads bought for $1.50 at a yard sale. You might not have ribbon you paid just $1.00 for a grocery bag full. 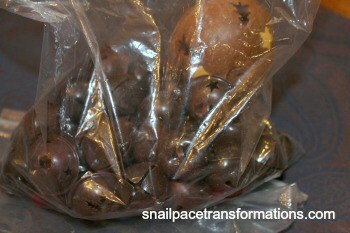 And I am going to guess you don’t have a bag full of yard sale found Christmas bells either. What is my point? Well it is not to make you frustrated that you can’t find good deals, because you can. My point is to help you to dig into what you already have around the home to create crafts for less. 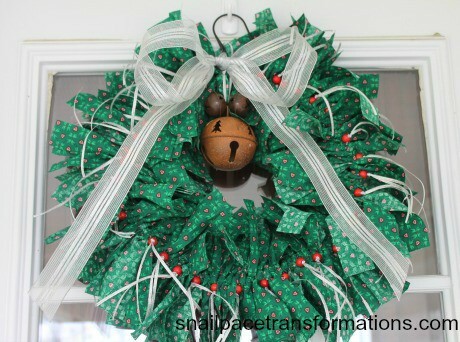 You might not have any thing that I have, but you might have a green and red shirt hanging in your closet that you have not worn in years that you could cut into scraps to make a wreath. You might have an old wreath that is worn but still has a great set of bells on it. Your local thrifty store might have an old beaded Christmas garland you could purchase for $1.00 and take apart for the beads. Your mailbox might have a coupon in it for a local craft store for 50% off your choice item, use it to buy a huge spool of ribbon. 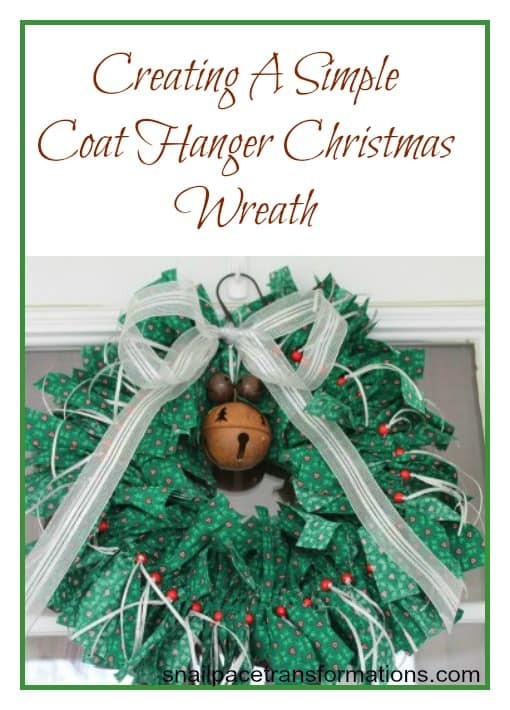 Now with that your thrifty wheels are turning inside your head, I will show you how I made my coat hanger Christmas wreath so that you can use what you have or can purchase at low cost to make yours. I used this pin as a rough guide for my wreath, adapting it to fit what I had on hand and adding my own personal flare. You will also notice that I did not take my hanger apart but instead left the hook intact. 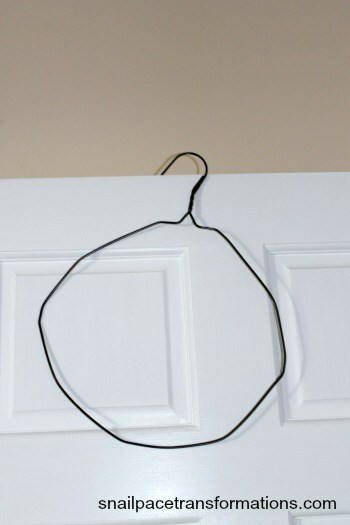 I did this, for two reasons, one it saved time ,and two it made it really simple to hang on my door by the small hook I already owned. 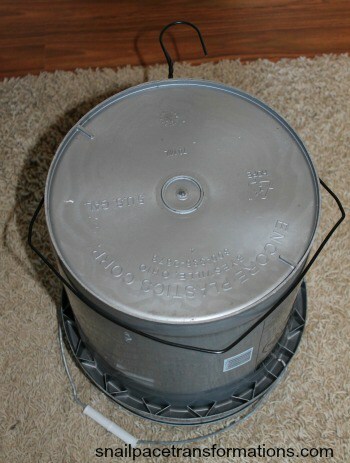 I shaped my wire hanger into a circle by pushing it over the sides of a 5 gallon pail. This worked really well and just left the original kinks on the hanger. I smoothed the kinks out with my bare hands after taking it off the gallon pail. Wire pliers would have made this job a lot easier but my husband was not sure where he was and was not volunteering to go out in the dark to the tool shed to find them with a flash light and well neither was I . The circle does not have to be completely perfect it just as the fabric will help mold it as you work with it. I had already cut an entire bolt of Christmas print fabric that I got for $6 into 1 1/2 inch strips intending to use it for locker hooking, so I don’t have photos of that step. I simply folded each strip into 4ths and cut it making a large pile of approx. 6 inch long strips of 1 1/2 inch wide fabric. I then started tying them in the middle around the wire and working them so they were all right sides up on one side and all wrong side down on the other side. I then decided to add in the ribbon and beads between every third fabric strip. I cut the ribbon about 1 inch longer than I had cut the fabric strips. I then folded the ribbon in half around the wire hanger and slid a bead on it. To hold the bead in place I tied a double slip knot at the top of the bead. 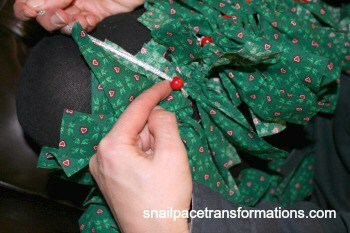 I kept bunching up the fabric and bead strips until it would not budge no more. At that point I used my fingers to pop all the red bead strips on top of the green material strips. 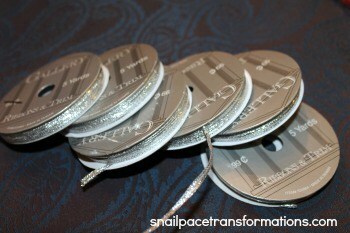 I then strung the big Christmas bells on some more ribbon and put them over the hook of the hanger. I then used some wide white and silver ribbon I had into a bow around the top. Truth time. This is the first wreath of any kind I have ever made. I am very pleased with the results and recommend this style of wreath to any newbie wreath maker out there. Of course don’t go out and buy all new full price materials to completely match mine. That would make make my thrifty side cringe! Instead I want you to get your creative cap on and start looking around your house, in craft bins and closets for things you could use to create your own one of a kind Christmas wreath for less (or at least use coupons, shop sales, and visit thrift stores for supplies). Want more Christmas Tips? 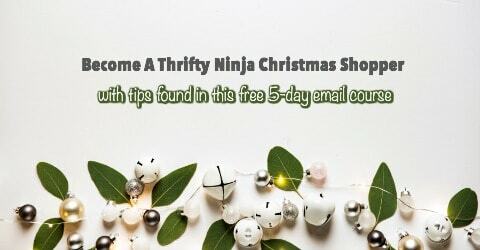 Follow the Thrifty Christmas Tips Community Board , or my Christmas Board on Pinterest.